be commensurate with our science and technology, the future of humanity in the 21st century is Utopian. We will have re-engineered the surface of the Earth with cities, transportation and communication systems, and new energy infrastructure which are designed and constructed to have optimal efficiency according to known science. We will have also spread across much of the solar system and, perhaps, have sent robotic spacecraft off to the nearest star system, Alpha Centauri. Aside from re-engineering the Earth and other worlds in our solar system, we will also likely re-engineer ourselves as we merge with our technology and machines. This will be the subject of discussion in this article. According to Elon Musk and Ray Kurzweil, it is the destiny of humanity to physically merge with technology and machines. We will all become cyborgs: part human, part machine. The term "cyborg" is oftentimes used very vaguely, but for our purposes we'll define a cyborg as any human with some form of technology embedded on or within their bodies. This definition is very broad and doesn't just apply to Arnold Schwarzenegger from the movie Terminator, but it also applies to someone wearing contact lenses. In the future, people will have access to contact lenses which, once augmented, will make their vision three times as powerful (see article)—a kind of "60/60 vision." We have already developed fully functional internet glasses and contact lenses in the laboratory. Once augmented, organic light-emitting diodes embedded in the glasses or lenses can generate a holographic, interactive image of an internet desktop screen about arms length in front of the user. Today's internet glasses require one to use a remote control to navigate the screen; but in the future, it is possible that the user will be able to navigate the screen using sheer thought alone. Today, internet goggles are ushering in the age of augmented reality: the virtual world superimposed on the real world. As shown in the video above, these goggles can bring the colleseum of Ancient Rome back to life. Researchers have also successfully used augmented reality to reify a few other ancient lost cities and places. Perhaps even more exciting is virtual reality. Virtual reality can transport users from the real world to a completely imaginary fantasy world. Technology of this kind has been developed by the US army. Soldiers step on a uniderectional treadmill (a device which allows them to walk in any direction for any distance without their relative position above the floor changing) while wearing VR goggles and become immersed in a battle scene where they must destroy enemies and accomplish specific tasks. But in the future, war will be obsolete. Virtual reality will be used instead to make extraordinary and breathtaking video games, and it will allow us to tour alien worlds like the Moon, Mars, Proxima B, Gliesa-587, and many others without actually going their. Indeed, Elon Musk said that the graphics in videos games will one day become indistinguishable from reality. If this one day turns out to be true, then a user could wear VR goggles and be transported into an imaginary fantasy world that is indistinguishable from reality. The user could walk around on their unidirectional treadmill (from the convenience of, say, their living room) exploring these fantasy worlds. Of course, the virtual environment need not mimic a real place like Proxima B or Gliesa-587; it could just be an environment from one's favorite movie or video game. If the user used only a set of VR goggles and a unidirectional treadmill alone, this would only simulate sights and sounds. But by using haptic technology, we could also simulate the sense of touch. Thus, when you touch a virtual object in your virtual environment, special gloves the user wears could simulate pressure and even over a thousand different kinds of textures. Augmented reality—superimposing fantasy on the real world—will transform the fields of medicine and education. Architecture students will stand in an empty room wearing AR goggles and see their designs pop up in front of them; medical students can practice surgery hands on on virtual patients in augmented reality; and engineers can study virtual engines and airplanes. In the future, there still might be some forms of surgery not yet automated. As a surgon is performing surgery, their contact lenses will prompt them with labels of different body parts with short description for each body part under each label. "Perhaps then, in the future, we could send dozens of blood-cell sized nanobots into the human blood stream to monitor our health and to repair damaged cells and tissues. These miniaturized nanobots could also autonomously deliver nutrients to our bodies, making the need for consuming food and drinks no longer necessary but, rather, something that is optional. In many ways, our biology is sub-optimal. It has been calculated that if we replaced 10% of red blood cells in our bodies with a specific type of nanobot known as a respirocyte, we would be able to run an Olympic sprint for 15 minutes straight without taking a single gasp of air or sit on the bottom of our pool for four hours. I think that the use of miniaturized computers, as well as CRISPR, will play a profound role, over the next couple of decades, in improving the longevity and functionality of our bodies." If Moore's law continues for a few more decades, we should expect such nanobots to be a part of our future. But even today, researchers have created miniature devices and machines capable of circulating our bodies and monitoring our health. One of these devices is the shape and size of a small pill. This device has a TV camera attached to it which can be used to take pictures of internal organs and then radio the data back for a doctor to view. Another nanodevice created by another group of researchers is a tiny spherical structure. Ordinary healthy cells have porous membranes with very tiny holes in them; this nanodevice is only 10-100nm in diameter but, despite its small size, is far to small to pass through an ordinary cell. By attaching a particular kind of anti-body to the device, the device can automatically move through the bloodstream to tumors inside the body. Once the nanodevice arrives at the sight of a tumor, one possibility would be to have the device deliver a payload to each of the cancer cells—this would destroy most of the cancer cells comprising the tumor. Another possibility would be to have them shine an ultra-energetic laser on the tumor. This would increase the vibrational kinetic energy of the cancer cells until, eventually, the cancer cells oscillate and shake so violently that their cell membranes rupture effectively rendering the cancer cells useless. We might never find a cure for cancer; but, in the future, what we will be able to do is destroy small tumors composed of only hundreds of cancer cells several years before the host gets full-fledged cancer. Thus, in the future, no one will get cancer since tiny nanobots circulating the human bloodstream will prevent large colonies of cancer cells from forming. We are now able to 3D-print fully functional, artificial hearts—superior to biological hearts—using stem cells. Today, there are people alive and well, going about their daily business, without a biological heart and without any pulse (see video). It is, of course, very unlikely that someone who is perfectly healthy without any heart condition would opt for an artificial heart; but for the many people who are currently awaiting a heart transplant, such an option shows much promise. Today, we are also capable of 3D-printing fully functional artificial bones, pancreases, ears and noses, and skin. Those for whom these body parts are perfectly healthy will most likely not want the replacement surgery done. But, it seems inevitable that in the future we'll be able to radically extend the human lifespan. Even if someone is exceptionally healthy, if they live long enough, it is possible that some of those aforementioned body parts will fail and will need to be replaced. Many humans in the future, and particularly those with missing limbs, will have fully functional, prosthetic, robot limbs. Today, ex-soldiers who lost their limbs in combat have undergone surgery giving them "robot limbs," superior to our own, which can be controlled through their sheer though alone as demonstrated in the video above. We have also developed cars which can be controlled by our thoughts alone. In Star Trek, an ancient civilization much more advanced than human civilization were able to control everything in their physical environment using just their thought. Perhaps humanity has a similar future. In the early stages of terrraforming and colonizing Mars, there would be so much radiation and the atmospheric chemistry, the air pressure and the surface temperatures would be so harsh that it would be dangerous (though not impossible) for humans to navigate the martian surface. The same is also true for many other worlds in the universe such as the Moon, the planet Venus, or Saturn's moon Titan. Ignoring the Moon, we could today build outposts on these other worlds and, in the future, we'll circumvent the dangers associated with navigating those worlds by controlling robot surrogates with our minds. Today, by wearing an EEG helmet, one can control the movement of a robot named ASIMO (shown in the image in the upper-right) using sheer thought. By just thinking, we can control the arm and leg movements of this robot. Despite the robot's locomotion being pitifully clumsy, during the next several decades, the dexterity and agility of such mind-controlled robots will continue to increase. 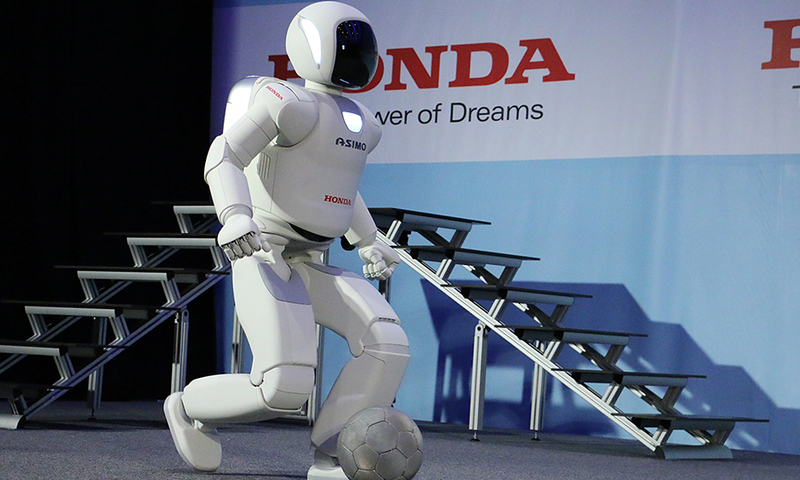 Since the speed of radio waves are enormous (\(186,000mps\)), we could control robots like ASIMO with our minds over immense distances. We could, for example, cause the robot to walk on the Moon while just thinking about it from home on the Earth. Assuming that improvements are made over the next several decades, this could perhaps play a central role in mining operations on the Moon and Titan. But on distance scales even to the nearest planet, radio waves are far too slow to control a robot from millions of kilometers away. To control a robot on Mars using our thoughts, we would have to build an outpost somewhere on Mars or an artificial space habitat in Martian orbit; or if we wanted such a robot to explore the vast liquid methane oceans of Titan, we could, likewise, perhaps build an outpost on Titan or an artificial space habitat (such as an O'Neil cylinder) that revolved around that world. Aside from extraterrestrial applications, mind-controlled robots would also be very important on Earth for various underwater missions, repairing infrastructure, and working in environments with high amounts of radiation. But perhaps, as many scifi stories have talked about, we could go much farther than this and actually live out our lives as such robot surrogates. This might one day actually be possible by using internet goggles or contact lenses (which would allow us to "see" everything which the robot sees) and by utilizing other technology which would allow us to "feel" everything that the robot touches. Such a future possibility is, however, so far just speculation and an extrapolation about the future of our technology. Something called a brain-surface interface (or BSI for short) could be integrated into the human brain to improve our cognitive functions (i.e. intelligence and memory). Elon Musk started a company called Nuaralace and is working with researches to develop a BSI. This device would merge human intelligence with artificial intelligence. This would be very useful since there are many tasks which human intelligence is pitifully clumsy if not incompetent at (such as performing basic arithemetic with large digit numbers or remembering and reciting a long list), but which computers excell at. With a BSI, the days of spending many months or years to learn a new skill might be long gone. In the movie, The Matrix, the main character Neo was able to learn kung-fu instantly by downloading knowledge into his mind. Perhaps, the development of a BSI by Nuaralace would allow us to be like Neo and download knowledge and new skills into our minds. Perhaps even more mindblowing than this is Ray Kurzweil's vision of humanity one day being able to upload their minds onto the internet and being able to live in a virtual reality as an avater. These are exciting possibilities (or scary, depending on your point of view) but are likely very far away from being developed. 1. Kaku, Michio. Physics of the Future: How Science Will Shape Human Destiny and Our Daily Lives by the Year 2100. Anchor Books, 2012. 2. WatchTheDaily. "Michio Kaku on Augmented Reality". Online video clip. YouTube. YouTube, 23 November 2011. Web. 03 November 2017. 3. Futurism. "The World's Most Advanced Prosthetic Arm Is Now For Sale". Online video clip. YouTube. YouTube, 23 January 2017. Web. 03 November 2017. 4. The bionic body: breakthrough transplantation devices. Futurism. Web. 03 November 2017. 5. Leal, Gregory. “Exponential Growth of Information Technology”. Greg School, Gregory Leal, April 04 2017, https://www.gregschool.org/articles9blog/2017/3/14/exponential-growth-of-information-technology-1?rq=expon. 6. Alex Klokus. (n.d.). In Facebook [Personal]. Retrieved November 03, 2017, from https://www.facebook.com/humansofthefuture/.